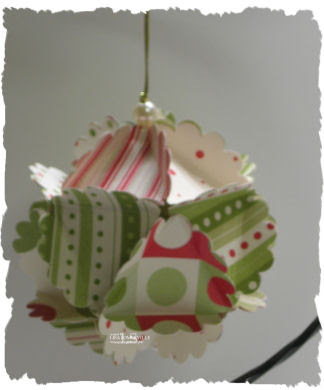 Select 5 scallop pieces for your ornament top. Using your snail, adhere one flap from two different circles, make sure that the triangle points meet, and your scallop edges are flush. 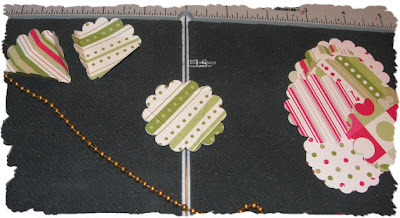 Use this same process to attach the remaining 3 scallop pieces to complete the top of your ornament. Repeat to create your bottom piece. Set these aside. To finish your ornament, thread your elastic cord through the center of your top piece, tie on a bead from the Pretties Kit, using snail, adhere the flaps from the top to the available flaps of the middle section. Thread the cord through the center of the bottom, adhere the bottom flaps to the available middle section. Tie a Pretties Bead on the end of your elastic cording. 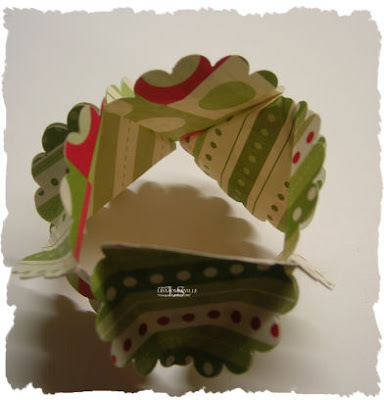 Wow, what a great way to use scrap pieces of designer paper. 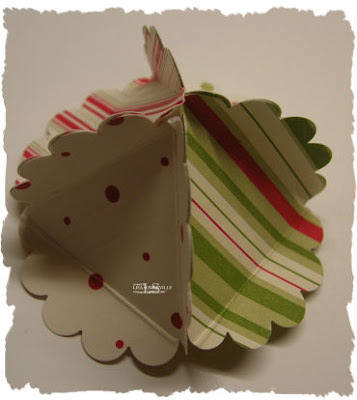 You know the ones that are too big to throw away, but to small to make a card with! Great tutorial. I'll have to see if my Boy Scouts can do it, we need a new Christmas project! Thanks for the great tutorial! love it Lisa - great job!! I think I will be doing this to decorate my tree this year!! Awesome ornament Lisa! And thanks for the tutorial--can't wait to try one myself! You're just full of tutorials today!! what a neat ornament, thanks for showing!! This is super! I love it. I just tried the other one that is floating around and loved it too. I need to do this one tomorrow. By the way, I tagged you on my blog and mentioned that there are a bunch of tutorials over here that people would not want to miss. Hope you don't mind. Oh my gosh Lisa! LOVE this idea!!! What a fun little project to do with a couple of my girlfriends! LOVE it! Thank you so much for sharing! Thank you sooooo much for the visuals. I would have never figured it out. You're the best!